Poisoning is the leading cause of injury death in the United States. Drugs—both illicit and pharmaceutical—are the major cause of poisoning deaths, accounting for 90% of poisoning deaths in 2011. Misuse or abuse of prescription drugs, including opioid-analgesic pain relievers, is responsible for much of the recent increase in drug-poisoning deaths. A new report highlights trends in drug-poisoning deaths involving opioid analgesics (referred to as opioid-analgesic poisoning deaths) and updates previous Data Briefs on this topic. The age-adjusted rate for opioid-analgesic poisoning deaths nearly quadrupled from 1.4 per 100,000 in 1999 to 5.4 per 100,000 in 2011. 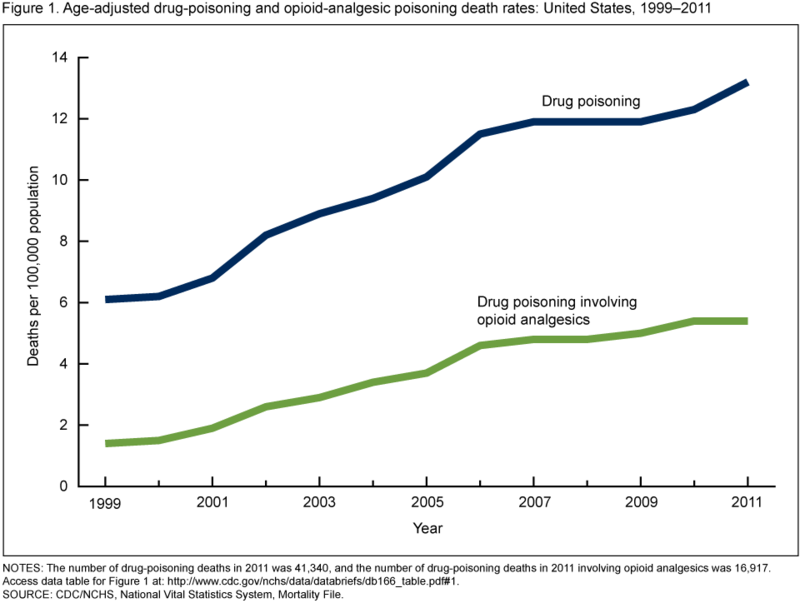 Although the opioid-analgesic poisoning death rates increased each year from 1999 through 2011, the rate of increase has slowed since 2006. Natural and semisynthetic opioid analgesics, such as hydrocodone, morphine, and oxycodone, were involved in 11,693 drug-poisoning deaths in 2011, up from 2,749 deaths in 1999. Benzodiazepines were involved in 31% of the opioid-analgesic poisoning deaths in 2011, up from 13% of the opioid-analgesic poisoning deaths in 1999. During the past decade, adults aged 55–64 and non-Hispanic white persons experienced the greatest increase in the rates of opioid-analgesic poisoning deaths. This entry was posted on Tuesday, September 16th, 2014 at 2:47 pm and is filed under Deaths. You can follow any responses to this entry through the RSS 2.0 feed. You can leave a response, or trackback from your own site.